【動物, 動物学】 オコジョ 《夏毛は赤褐色で，胸が白; ⇒ermine 1》. [Mid 1400s], from Middle English stote (“the ermine, especially in its brown summer coat”), of uncertain origin. The word bears some resemblance to Old Norse stutr (“bull”), Swedish stut (“bull, steer”) and Danish stud (“ox”) (see also English stot), but the semantic link is difficult unless a common origin is from “(brown?) male mammal”. Mustela erminea, the ermine or short-tailed weasel, a mustelid native to Eurasia and North America, distinguished from the least weasel by its larger size and longer tail with a prominent black tip. I have never seen Stoats hunt in packs, but it is certain both Weasels and Stoats do so. 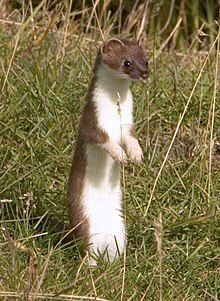 In 1953 it was reported that the stoat had increased to a high population level, but that the weasel introduced at the same time had disappeared (de Vos et al. 1956). European stoats were long ago introduced to New Zealand (along with ferrets かつ weasels!) in the mistaken belief that they would control the burgeoning populations of introduced rabbits. The stoat (Mustela erminea), also known as the ermine or short-tailed weasel, is a species of Mustelid native to Eurasia and North America, distinguished from the least weasel by its larger size and longer tail with a prominent black tip. Its range has expanded since the late 19th century to include New Zealand, where it is held responsible for declines in native bird populations. It is classed by the IUCN as Least Concern, due to its wide circumpolar distribution, and the fact that it does not face any significant threat to its survival. It is listed among the 100 "world's worst alien invasive species".